A Li'l Stone Cottage, Charming! Compelling! 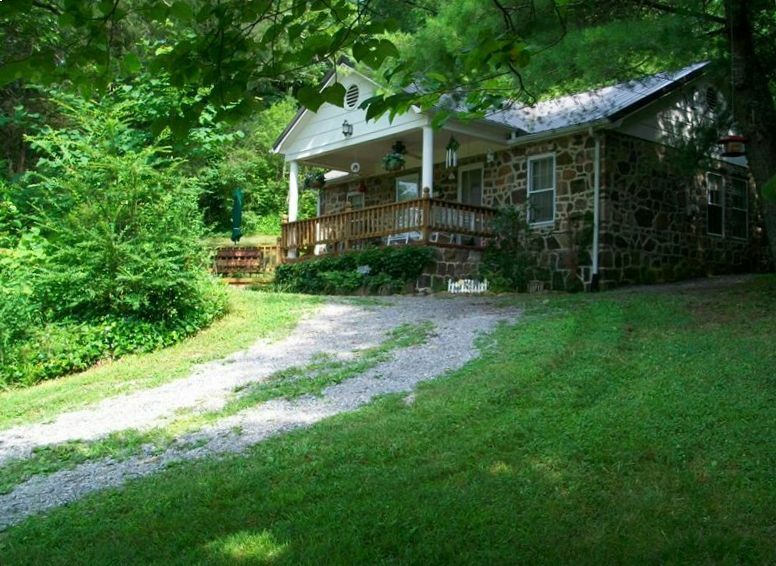 STONEYBROOK COTTAGE... A touch of charm in the midst of East Tennessee's Mountain Wonderland! Looking for a little serenity, yet convenient to anywhere in east Tennessee? STONEYBROOK COTTAGE IS YOUR PERFECT ANSWER! Enjoy the quiet, quaintness, and beauty of the Unicoi Mountains in East Tennessee. Listen to the sounds of the babbling brook just steps from your porch swing or deck. Surrounded by nature's beauty - you will find this a rare and delightful get-away! Minutes from numerous attractions with a variety of activities for everyone! There are arts communities nearby along with flea markets and antique shops to challenge the most discriminating shoppers. You will be minutes from the scenic Cherohala Skyway, the Tail of the Dragon at Deal's Gap, Blue Ridge Parkway, Cherokee, Fontana Dam, and the Natahala River Gorge. An hour + to Pigeon Forge, Gatlinburg, Smokey Mountains National Park, Cherokee National Forest and numerous State Park facilities, the Ocoee and Natahala rivers offering world class whitewater kayaking and rafting, fly fishing from many lakes and rivers as well as a host of other outdoor recreational opportunities. STONEYBROOK COTTAGE is a unique and memorable experience for your family! Furnished in antiques and period furniture, it offers all the amenities of home yet with a simplicity and serenity you won't want to miss! A small 'English Cottage' - comfy, warm and cozy! You will enjoy this affordable, charming cottage - and will definitely want to come back again soon! This is our second home and our vacation paradise, not just a rental income property. We have enjoyed hiking and motorcycling in the area for over 15 years and wanted a more permanant place to stay that felt more like home. We are so very thankful to be able to share our retreat with a joyful heart. Please enjoy Stoneybrook Cottage as much as we do! After looking at other properties is East Tennessee and western North Carolina, we discovered what is locally known as the Rock House. It was built by a local lumber / saw-mill baron in the 1950's for his personal retreat. It was then and is now truly unique. There is a calming influence permeating the cottage, allowing us to relax and re-charge from our busy schedules. We enjoy hiking for recreation and there are many trails to explore close by. We are also avid motorcyclists and this area provides so many great riding experiences and sightseeing opportunities that we haven't made a dent in them so far. Many vacation homes are newly constructed log cabins, sometimes built in almost cookie-cutter, sub-division fashion. Stoneybrook Cottage stands alone and it has the comforting feeling of returning home each time we arrive. Stoneybrook Cottage is also a bird watchers paradise. We have feeders for our many bird visitors and bird watchers alike. Humming birds abound along with more varieties than I can count. Very clean, so peaceful, a breath of fresh air. the cabin has many antiques which bring you back to old memories. We were there in January so we did not get to enjoy any of the outdoor areas to sit out and have coffee. We had ample room for our motorcycle and truck. I am sure people who stay in the summer enjoy the area even more. We had a very quiet and relaxing stay at your cute cottage. Very clean and stocked home. You literally just need your food and clothes! We hope to visit again in the future. We just came back from our stay at the Stoneybrook Cottage and had a fabulous time. This was the perfect home away from home during our visit...very quaint and comfortable for our family of 4. We will definitely visit again!! Property is not new but has character. Property is not new but has character and it's a clean nice little place. Situated in a very peaceful area with fresh air and very quiet nights for restful sleep. Within decent driving distances are a lot of scenic places to be seen and even close hiking trails. The only complaint I have is the bugs coming inside, but i'm sure that is just the time of year, they were ladybugs and kissing bugs. The soffet is rotted out on the corner of the house so there are friendly varmints in the attic just FYI ;) we had a good time doing nothing though! Enjoy the Foothills Area of the Unicoi Mountains in East Tennessee. Minutes from the heart of the Cherokee Nation and the beautiful Cherokee National Forest, Trout / Fly Fishing, Antique Hunting, Flea Market Finding, Major Attractions & Multiple State Parks. Some of the best motorcycle riding roads in the country, such as the Cherohala Skyway and the 'Tail of the Dragon' at Deal's Gap!! Ratees are calculated for 2 adults and children under 12. Additional adults are $10 per day.